Below is a list of most of the academic talks I’ve given over the years. 11-2018 Invited speaker at the Kings College London Quantitative Systems BIology Workshop. “Hybrid frameworks for modelling reaction-diffusion processes”. 09-2018 Invited speaker at the University of Nottingham Applied mathematics seminar. “Hybrid frameworks for modelling reaction-diffusion processes”. 07-2018 Invited speaker at the ECMTB minisymposium “Multi-scale models of cell behaviour“. “Incorporating a multistage representation of the cell cycle into models of cell migration”. 05-2018 Invited speaker at the University of Glasgow applied mathematics seminar. “Hybrid frameworks for modelling reaction-diffusion processes”. 04-2018 Speaker at the UK conference on multiscale biology. “Hybrid frameworks for modelling reaction-diffusion processes”. 03-2018 Invited Speaker at the University of Edinburgh’s mathematical biology seminar. “Hybrid frameworks for modelling reaction-diffusion processes”. 12-2017 Invited speaker at University of Southampton’s applied mathematics seminar. “Hybrid frameworks for modelling reaction-diffusion processes”. 10-2017 Invited Speaker Imperial College London Biomathematics seminar. “Hybrid frameworks for modelling reaction-diffusion processes”. 09-2017 Speaker at the Zeeman Institute launch meeting, University of Warwick “A multistage model of the cell cycle”. 05-2017 Invited speaker at the University of Warwick Warwick’s Zeeman Institute for Systems Biology and Infectious Disease Epidemiology Research (SBIDER). “Hybrid frameworks for modelling reaction-diffusion processes”. 07-2016 Invited speaker at the SMB/ECMTB conference minisymposium – Spatial patterning at the single cell level “Connecting coarse- and fine-grained volume excluding models of diffusion”. 07-2016 Invited speaker at the Evolution group seminar series at the University of Bath Biology and Biochemistry Department. “Hybrid frameworks for modelling cell migration”. 06-2016 Invited speaker at the Spatially Distributed Stochastic Dynamical Systems in Biology conference, as part of the Newton Institute programme on Stochastic Dynamical Systems in Biology: Numerical Methods and Applications. “Hybrid frameworks for modelling cell migration”. 05-2016 Invited speaker at the Cell and Developmental Biology Seminar series at the University of Bath Biology and Biochemistry Department. “Hybrid frameworks for modelling cell migration”. 05-2016 Invited speaker at the applied non-linear mathematics Seminar at the University of Bristol Engineering Department. “Hybrid frameworks for modelling cell migration”. 04-2016 Invited speaker at the workshop on “fluctuation-driven phenomena in biological systems” at the University of Warwick Mathematics department. “Hybrid frameworks for modelling cell migration”. 11-2015 Invited speaker at the University of Birmingham Applied Mathematics seminar, “A PDE/compartment-based hybrid method for simulating stochastic reaction-diffusion”. 10-2015 Invited speaker at the Biomath seminar series, Chalmers University, Gothenburg, Sweden, “Developing PDE-compartment hybrid frameworks for modeling cell migration”. 09-2015 Contributed talk at the IMA Conference on Numerical Methods for Simulation, University of Oxford, “The pseudo-compartment method for coupling PDE and compartment-based models of diffusion”. 06-2015 Speaker, chair and organizer at SMB mini-symposium on “Multiscale hybrid modelling of stochastic reaction-diffusion systems”, Atlanta, Georgia, “The pseudo-compartment method for coupling PDE and compartment-based models of diffusion”. 05-2014 Invited speaker, CoMPLEX, University College London, “Modelling Melanocyte cell migration”. 03-2014 Invited speaker, School of Physics and Astronomy, University of Manchester. “Revisiting locust switching behaviour”. 11-2013 Invited speaker at the Department of Mathematical Sciences, University of Essex. “Modelling Melanocyte cell migration”. 10-2013 Invited speaker, School of Physics and Astronomy, University of Manchester. “Modelling Melanocyte cell migration”. 11-2012 Invited speaker at Herriot Watt University, Department of Mathematics in Edinburgh. 10-2012 Invited speaker at statistic workshop, University of Oxford. “From Antigenic variation to antZ”. 07-2012 Invited speaker at the workshop “Ethology and Rheology of Physarum and its related topics“. Future University, Hakodate, Japan. 05-2012 2020 science seminar series. “From Antigenic variation to AntZ”. 05-2012 Departmental research update Centre for Mathematical Biology, University of Oxford. “From Antigenic variation to AntZ”. 03-2012 Invited speaker at the CoSy Lunch Seminar series, University of Uppsala, Sweden. “Modelling cell migration: from discrete to continuous”. 02-2012 Invited speaker at the Computational biology group meeting , University of Oxford. “Stochastic modelling: From Locusts to Egg-shells”. 10-2011 Invited speaker at the stochastic modelling discussion group series, University of Oxford. “Efficient and Accelerated Stochastic Simulation Algorithms”. 06-2011 Invited speaker at the Doctoral Training Centre summer conference, University of Oxford. “Modelling cell migration: A D.Phil. in movies”. 05-2012 Departmental research update Centre for Mathematical Biology, University of Oxford. “Modelling cell migration: A D.Phil. in movies”. 04-2011 Invited speaker at the individual based modelling discussion group series, University of Oxford. “Return to Eden: How biologically relevant can on-lattice models really be?”. 10-2010 Invited speaker at the Math-Bio-Medicine (MBM) seminars series, University of Leeds. “United by noise: Randomness helps swarms stay together”. 09-2010 Invited speaker at Culham Science Centre (home of UK’s fusion research programme, and JET). “United by noise: Randomness helps swarms stay together”. 06-2010 Invited speaker at the Fourth annual Systems Biology Inter-DTC Conference (University of Warwick Systems Biology Centre) “A comparison of stochastic and analytical models for cell migration”. 04-2010 Invited speaker at the Manchester SIAM student chapter conference “Comparing Stochastic and Continuum Models For Cell Migration”. 11/2009 – Junior Applied Mathematics Seminar “A comparison of stochastic and analytical models for cell migration“. 10/2009 – Departmental Transfer of Status talk “A comparison of stochastic and analytical models for cell migration“. 05/2009 – Invited speaker at Princeton University Department of Engineering: “United by noise: Randomness helps swarms stay together”*. 05/2009 – Mini-symposium speaker at the SIAM Conference on Applications of Dynamical Systems, Snowbird, Utah: “United by noise: Randomness helps swarms stay together”*. 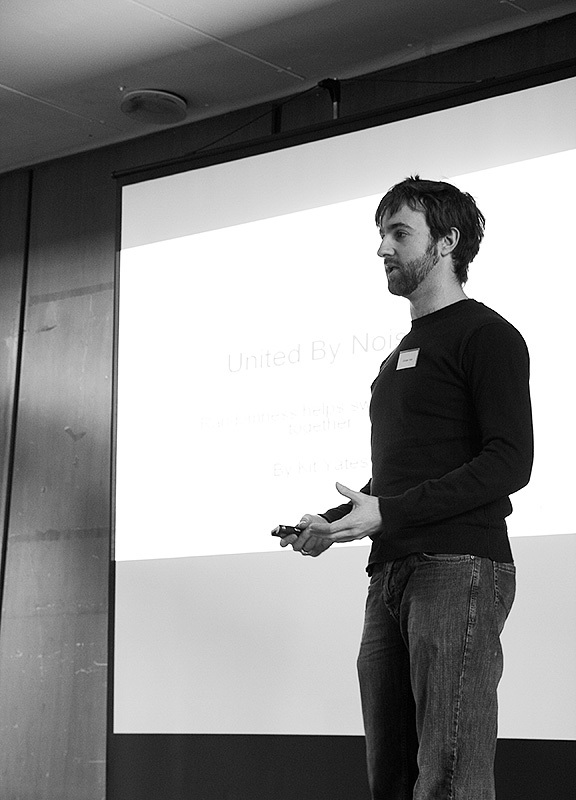 02/2009 – Invited speaker at the 2nd Annual Oxford SIAM Student Chapter Conference: “United by noise: Randomness helps swarms stay together”. 10/2008 – Junior Applied Mathematics Seminar “Locust Pocus: How Does Randomness Help Swarms Stay Together”.